The Purex brand provided me with a sample of Purex Crystals Fresh Mountain Breeze exchange for a product review. However, all the opinions expressed here are my own. I do lots of laundry. With three active big kids, I pretty much spend all of Sunday sorting, running, and folding laundry. And I want it to smell nice and fresh! So I was really excited to give Purex Crystal Fresh Mountain Breeze a try. I've tried other Purex Crystals products, and I know that they're great. But would this product meet those high standards? The folks at Purex let me know that the new Purex Crystals Fresh Mountain Breeze help clothes smell fresh for weeks, not just days. The product doesn't reduce the absorbency of towels. And its natural formula is safe for your family and for the environment, too! So I ran a big load of musty, smelly towels. Before I started washing, I opened up the bottle of Purex Crystals and took a sniff. I immediately sensed a fresh, clean scent, one that you would definitely associate with clean clothes. I sprinkled in some of the crystals and ran my wash as normal. When I removed the clean, dry towels from the dryer, I could smell that great scent on the towels. It wasn't overpowering, but when I put my nose to the towels, it smelled great! I folded them up and put them in the linen closet. Several days later, I took an unused towel from that load and smelled it. The smell had disperses a bit, but the towel was definitely still smelling fresh and clean! Wow! So I definitely recommend Purex Crystals Fresh Mountain Breeze to keep your laundry smelling fresh! Would you like to try Purex Crystals Fresh Mountain Breeze? You can find the product at many local supermarkets, drug stores, and national chain stores. Check out the Purex store locator to find a store near you. And you can learn more about the Purex brand on the Purex Facebook page. Frugal Follies is hosting a giveaway for a free product coupon for Purex Crystals Fresh Mountain Breeze! Three winners will be chosen. 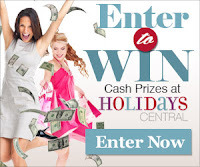 Each winner will receive one coupon for a free 28 oz bottle of Purex Crystals Fresh Mountain Breeze. This is a manufacturer's coupon and expires on 06/30/2014. It has a maximum value of $6.00. Limit one coupn per purchase of specified item. Limit of 1 like coupon in same shopping trip. The giveaway is open to residents of the 50 U.S. states plus the District of Columbia. The giveaway ends on Sunday, March 30, 2014. To enter, use the Rafflecopter form below! I want to try Purex Crystals Fresh Mountain Breeze because I've always liked Purex products. I like the way it makes my clothes smell for a long time. I want to try it because I am always looking for a better product to do my laundry with! I love Purex and the Purex crystals are one of my favorite products. My favorite is the Lavender and I am looking forward to trying this new scent! I have just purchased this product recently. I love it. It keeps your clothes smelling good for a very long time. I have tried other Purex products like the liquid detergent and it was very good so I would like to see how the crystals work. I want to try this product because I love trying new products and I love fresh scents. I would love to try these because I think hey would make my laundry smell absolutely wonderful & I would like that! I have been looking for something new to try that has a great quality and scent to it. And this will be perfect. I want to try Purex Crystals in the Fresh Mountain breeze scent because it sounds like it would make our clothes smell really good and I like the Purex products. I like to try new things, and would love to try the new Purex. 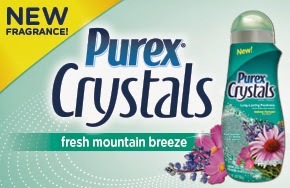 I want to try the Purex Crystals Fresh Mountain Breeze because Mountain Breeze sounds like a great scent. I want to try it because I want my clothes to smell fresh and clean!